My head is full of questions today. On the one hand, I need to get some front end evaluation data on young people and mobile gaming together, in just a month, so I’m composing an online survey about that. On the other hand it is the deadline for Bodiam Castle to submit bespoke questions for the National Trust’s visitor survey, so I need to get my head around what questions to try and persuade them to add. It can’t be everything that I’ll eventually ask on site, because the National Trust visitor survey is already pretty long. The most obvious one is did the visitor actually do (what I’m currently calling) “the thing” (because I don’t yet know what they’ve decided to call it)? But actually my 12 year old is counting down the days to her birthday when she’ll be able to comply with Facebook’s terms and conditions and open an account (which all her friends with more relaxed parents have apparently already done). So it seems there’s life in the old network yet. My first point of call of course was to ask her what “the young people” were using nowadays, but she didn’t say anything that was new to me. And actually she’s a bit younger than my target market, so I had better turn to some published data. I think its interesting that there’s such a steep difference between Facebook and the also-rans. The curve leaves very little room for other networks like Foursquare. Meanwhile the Oxford Internet Surveys show us that use of social media is begging to plataux at around 61 % of internet users generally. They also show us that Social Network use gets less the older the respondent is, with 94% of 14-17 year olds using networks, dropping t0 the mid-80% (the graph isn’t that clear) for 18-24 year olds. The full report of their 2013 survey concentrate on defining five internet “cultures” among users. Although they overlap in some respects these cultures define distinctive patterns. While these cultural patterns are not a simple surrogate for the demographic and social characteristics of individuals, they are socially distributed in ways that are far from random. Younger people and students are more likely to be e-mersives, but unlike the digital native thesis, for example, we find most young students falling into other cultural categories. The group of young people that I’m interested in here falls especially into two of those cultures: The e-mersive and the cyber-savvy. Both of which might be worth looking at in more detail later. What I can see now, though, is that these two groups are the most likely to post original creative work on-line (rather than simply re-post what others have created. Interestingly, between the 2011 and 2013 surveys, the proportion of users putting creative stuff online has dipped a little, except for photographs. I guess that may be the Instagram effect. In fact the top five Social Network activities recorded in the survey are updating status; posting pictures; checking/changing privacy settings; clicking though to other websites; and leaving comments on someone else’s content. Its an interesting report, but nothing novel comes out of it about young people’s use of the social networks. That should be reassuring I suppose, but it doesn’t particularly inform our front-end evaluation for a mobile game based around the Southampton Plot. So we’re going to have to ask young people themselves. How to we ask, first of all, what sort of games they are playing? There are too many to list, so I’m toying with a “dummy” question that simplying gets respondents into the mood, by asking about a relatively random selection of games, but trying to include sandbox games like Minecraft, story games like Skyrim, MMORPGs like World of Warcraft, social games like Just Dance, etc. (And throwing in I Love Bees, as a wild card just to see if anybody bites at the Augmented reality game that seems to be closes to our very loose vision for the Southampton Plot. But the real meat is a free-text question that simply asks what is their favourite game that they’ve been playing recently. My next thought has a bit more “science” behind it. Inspired by the simple typology put together by Nicole Lazzaro, I’ve taken seventeen statements her researched players used to illustrate the four types of fun she describes, and asked respondents to indicate how much they agree with them. My plan is to use some clever maths to identify what sort of mix of fun our potential gamers might enjoy. Then I’ve suggested a similar question about messaging networks, like What’sApp and Snapchat. I have also included a question about smartphones, whether they have one, one sort (iOS, Android etc) it is. And I’ve tried to create a question about how much of their social networking is mobile vs desk (or laptop) based, but it’s the one I’m least happy about. Finally, as we’re trying to use this game to get people to places, I’ve asked about transport: walking; cycling; public transport; catching lifts; and being about to drive themselves. We’ll see how mobile they turn out to be. And there it is, some correlation, but not as much as I was expecting. (I added text labels to each datapoint, with row numbers on, as a quick and dirty way to see roughly where a single point represents more than one respondent.) I think this demonstrates two things. 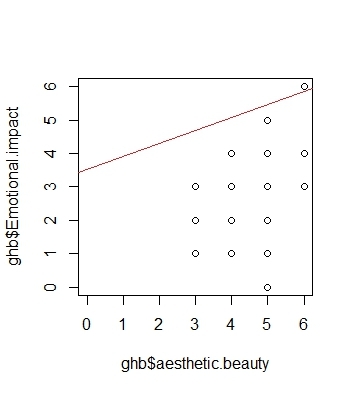 The first is that Likert scales can look awfully “categorical” when compared with true continuous numerical values. And the second is that I need a larger sample (if only to lessen the influence of outliers such as row 1, up the in the top right hand corner, which I fear maybe my own inputting error on the the first interview). 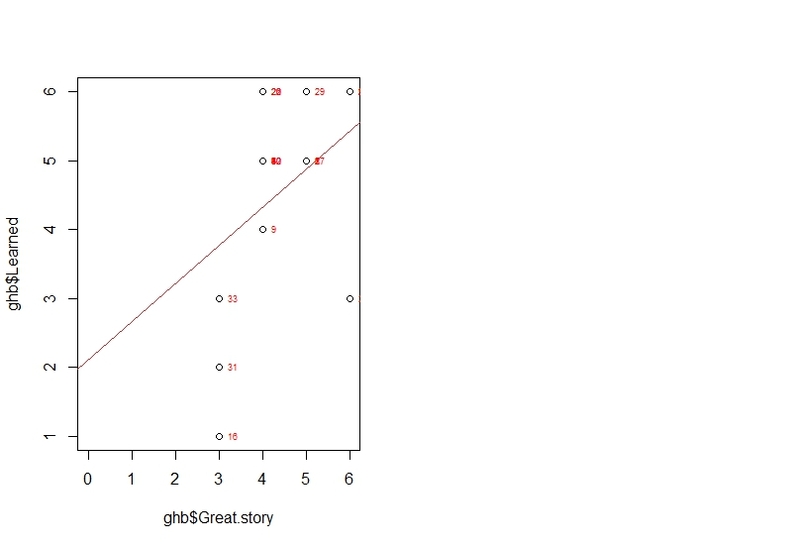 Looking through the results matrix, the strongest correlation that stands out (at 0.65) is between “It was a great story” and “I learned about what Bodiam Castle was like in the past.” Which is nice. But remember, correlation ≠causation. Here, I wouldn’t even know where to start, did they admit to learning because the story was great? Or was the story great because they learned about it? And of course neither distribution can be called “normal.” The “correlation” is helped by the skew in both distributions of course. There’s also an interesting strong correlation(0.57) between “I enjoyed talking about Bodiam Castle with the others in my group” and “I learned about what Bodiam Castle was like in the past.” Though I’m not suggesting cause and effect here, I’d like to follow up on this. 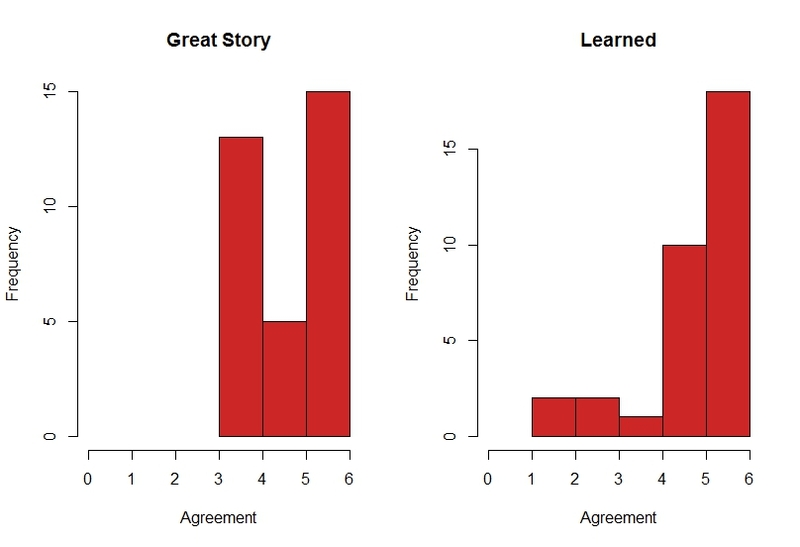 Similarly, there are correlations between the responses which agreed that Bodiam had a great story, and those who enjoyed chatting within their group as well as with staff. What about the lowest in the matrix? 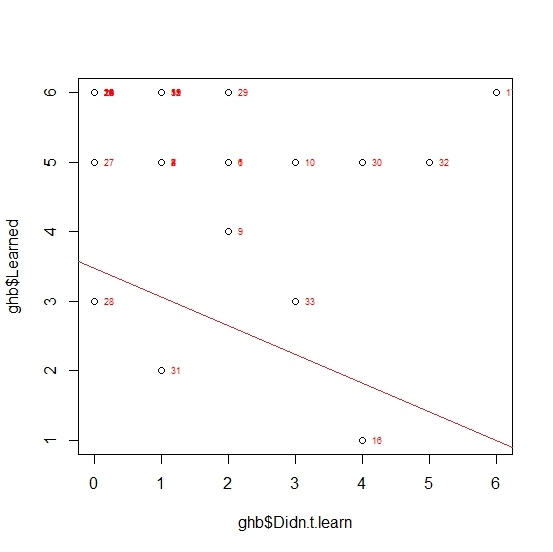 Rather scarily, there seems to be zero correlation between the “Didn’t learn anything new” statement and emotional impact. 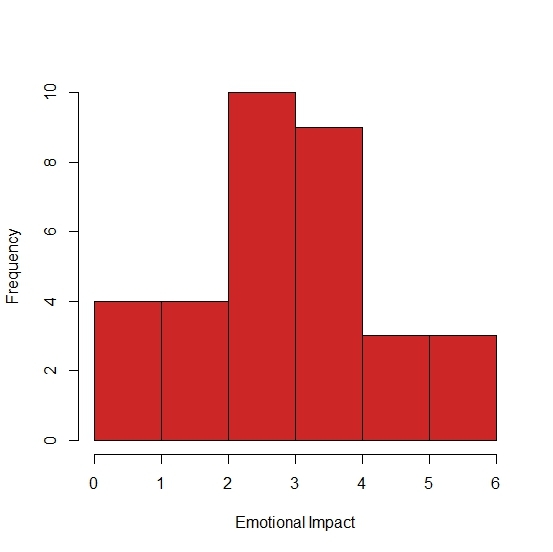 I’ve already told you about my caveats over emotional impact as something you can measure this way anyway, but zero correlation (when rounded to two decimal places) sets alarm bells ringing about one of these arrays. 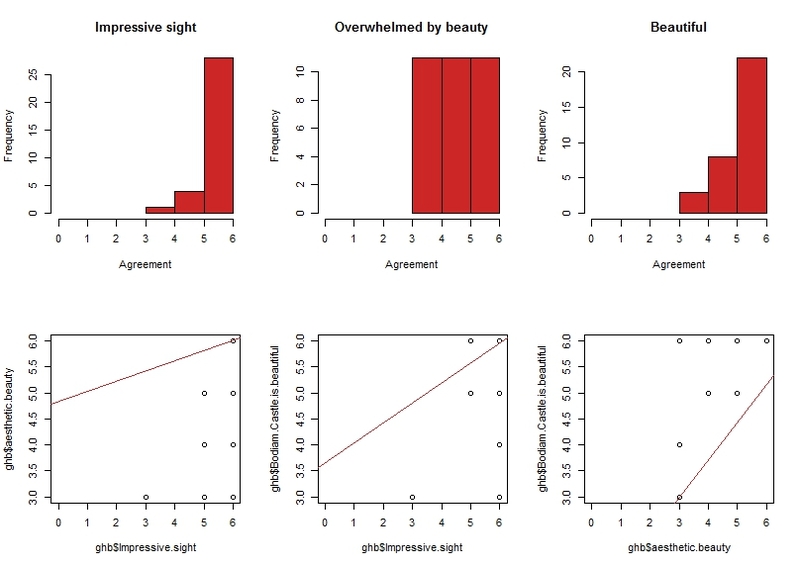 Its also interesting that, “Bodiam Castle is an impressive sight” correlates strongly with “Bodiam Castle is beautiful”(0.54) but less strongly with “I was overwhelmed with the aesthetic/beauty aspect of Bodiam Castle” (only 0.37). Those last two correlate strongly (0.55) with each other, of course. The “I wish I lived here when Bodiam Castle was at its prime” and “What I learned on the visit challenged what I thought I knew about medieval life,” statements didn’t yield anything particularly interesting. I might drop them from the next survey. But what troubles me most, in an existential way, is the correlation between “I was overwhelmed with the aesthetic/beauty aspect of Bodiam Castle” and “The visit had a real emotional impact on me”. My whole career has been build around the idea that people want to know stuff, to learn things about places of significance. While its nice that aesthetics and emotions are closely bound, is there any space for the work I do? I’ve been reading about the Bartle Test. It came up in conversation when somebody asked about player motivations. Turns out people have been asking similar questions for years, and after much discussion on the bulletin board of a UK “Multi-User Dungeon” Richard Bartle came up with a 1996 paper, outlining four gamer types. A few years later, Erwin Andreasen and Brandon Downey came up with a web based test which players could take. So I took it. Its a slow website, I gave up once, half way through, but eventually, discovered that I’m 93% Explorer, 73% Socialiser, 40% Acheiver, and 20% Killer. I’m not at all convinced by the validity of the test. It’s a sort of disguised paired comparisons test, but unlike many I’ve taken, there were plenty of questions to which I wanted to reply “neither”. Also, in its current iteration least, the website comments with attempted humour as the participant selects their answer. I’d fear that this might influence some participants to change their answer before submitting their reply. But I can’t deny that I’m most like the “Explorer”. Of course I don’t actually play MUDs (or the Massively Multiplayer Online Role Playing Games, with MUDs have evolved into) as I’m more of a table-top gamer. (I was going to say “old-school” but actually table top RPGs preceded MUDs but only a couple of years). So maybe it’s not surprising that I didn’t feel I could genuinely express a preference for either of the choices in some of the pairs. Maybe, as a player I don’t “suit” MUDs, as Bartle’s punning title to his paper implies. And the fact that I don’t play maybe the reason why I’m not entirely convinced by the four types Bartle suggested in the first place. Bartle pretty much invented MUDs after all, so I’ll bow to his experience. In fact Bartle himself re-configured his four type taxonomy to one which featured eight types: Friend; Griefer; Hacker; Networker; Opportunist; Planner; Politician, and Scientist in his book Designing Virtual Worlds. By it’s the four-type taxonomy which seems to have stuck. I don’t know why the eight-type has less traction, perhaps it’s because, as Bartle himself apparently said, the four type model is easier to draw. I’m also surprised no-one has attempted to create a Bartle test for this new taxonomy, or indeed to challenge the model itself. The only couple I have found are this one from Jon Radoff, looking specifically at player motivations but for more games than just MUDs, and this one from Nick Yee (his Daedalus Project does look like an interesting read). Perhaps there are other models but, given the multimillion (billion?) dollar industry that computer based gaming has become, perhaps the developers prefer to keep their player motivation models to themselves.